If the division doesn’t come out evenly, we generally just leave the division problem as a fraction. Since we can reverse a multiplication without affecting the answer, we say that multiplication is commutative. We’ll talk about reducing fractions in a bit. Don’t worry about that now. 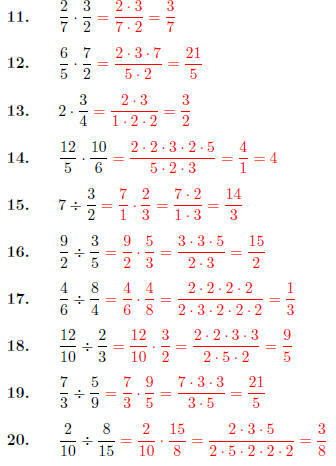 (unmultiply) the numbers in the fraction. same as multiplying by 1, and that doesn’t do anything. Here’s a couple of other examples. Since we’re multiplying by 5 and dividing by 5, that’s the same as multiplying by 1. It’s usually best to factor the numbers as much as you can. You’ll be able to see things more reliably. We’re multiplying by a 2 and 3, and we’re dividing by a 2 and 3. Since dividing by 5 is the same as multiplying by 1/5 , we can rewrite this as a multiplication. On the other hand, if we’re dividing by a fraction, this involves dividing by a division. In general, we just invert the fraction that we’re dividing by. It’s customary to reduce any fractions you get as an answer. 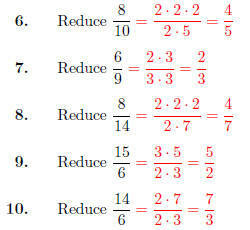 For the rest of these problems, multiply or divide, and then reduce as much as you can.